Early Monday morning, everyone with an internet connection learned that if they fly on United Airlines, they run the risk of being forcibly ejected from their seat and left covered in blood. Now, the Chicago Department of Aviation says that one of the officers involved in the incident has been placed on leave pending an investigation. The most notable part of the Department of Aviation’s statement is that it appears to admit that this situation was not handled correctly. “The actions of the aviation security officer are obviously not condoned by the Department,” it reads. Normally, if an employee is placed on leave pending an investigation, official statements don’t pass judgment on the incident. The initial outrage over the altercation was sparked by a tweet from a different passenger named Tyler Bridges who was on board and recorded the incident on his phone. The victim claimed to be a doctor who needed to see patients in the morning. 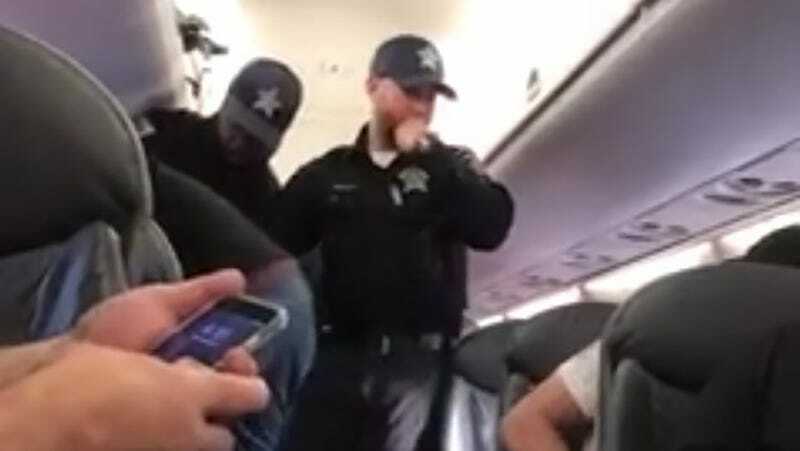 More videos of the man being handled appallingly popped up and we learned that United was attempting to eject paying customers from the flight in order to make room for an employee on stand-by. In an official statement, United’s CEO said that everyone at the company was “upset” and he apologized “for having to re-accommodate” customers. If United’s idea of accommodating passengers is leaving a senior citizen with blood running out of his mouth and begging for someone to “just kill me,” I’d hate to see what happens when they decide to not be accommodating.